Uday Jhala, 36, hates working out and loves his junk food and drinks. Yet, he weighs a healthy 67kg—the ideal weight for a man 5ft, 9 inches tall. “Given the amount of trash I eat and drink, I should be thrice my size. Thanks to football, I am fairly fit for my age," says Jhala. The Mumbai-based production consultant gets in four-five 90-minute football sessions each week. When he started in 2010, it was tough to even play once a week—getting 10 people who were free at the same time was difficult. But now he is part of a WhatsApp group which has 180 people. “The first 15-20 people to respond once the game notification goes out get to play," he says. Expert opinion: Football is an anaerobic form of exercise in which you work at a very high intensity in short bursts, says Roonam Patir, a Goa-based general physician. “The advantage of this kind of activity, as compared to aerobic exercise, is that your body continues to burn fat even after you stop playing, because of increased metabolic activity due to the high intensity exercise," says Dr Patir, who himself plays football in his free time. However, if you are just starting out, it would be a good idea to go slow. Otherwise, you could end up getting injuries, including sprains and stress fractures. It is also important to stay hydrated and eat properly if you play a high-intensity game in order to avoid cramps. Bhavin Patel, 38, used to practise kalaripayattu when he lived in Puducherry. The lawyer had to give it up when he moved to Mumbai in early 2016. He decided to try squash because there was a court in his apartment block. “When I started out, it was difficult to find someone else who was interested in squash in the neighbourhood," Patel says. “Luckily, three months after I started playing, a friend moved into the same complex and since then we have been playing three-four times a week, each session lasting anything from 90 minutes to 2 hours." Since starting squash, Patel has not only been able to manage his weight, but has also noticed a significant increase in stamina.“Squash has been easier to stick to because there is a partner who brings in the element of fun, interaction and competitiveness," he says. Expert opinion: Squash involves a lot of back and forth scampering at high speeds. It also requires players to change direction all of a sudden, all through the game. Quite like football, it is an anaerobic activity that helps burn fat and build muscle, making it a good way of weight management and loss, says Dr Patir. “The frequent change of directions at high speeds improves agility too," he adds. People with knee issues should be careful while playing squash. Ruchira Hoon-Philip, 38, has always tried to keep her weight in check. A former Masterchef India competitor, and currently a consultant chef and food blogger, she loves everything connected to food. Hoon-Philip has tried several things, starting with strength training in gyms, circuit training and power walking, but she gets bored quickly. Last year she tried a kickboxing class at a gym, and has been hooked since. “It is quite cathartic and a great outlet for stress," she says. Initially, she couldn’t sustain beyond 10 minutes per session but she persisted and was soon doing 30-minute sessions four times a week. In two months after that, Hoon-Philip lost about 7kg, and dropped some inches around her waist, arms and thighs. Expert opinion: Kickboxing is a great sport to both shed and manage body fat, says Gagan Arora, a Reebok master trainer and founder of Kosmic Fitness, New Delhi. It is a rigorous sport and requires a lot of hard work. It uses legs and arms in continuous fashion and burns a lot of calories during the workout. “People with cardiovascular diseases and musculoskeletal issues, such as arthritis and osteoporosis, should avoid contact sports of any manner," cautions Arora. Rahul Chaudhuri went back to playing tennis in 2010 after a 12-year hiatus. The first few days were tough. His serves were all over the place and, due to his excess weight and lack of exercise, he couldn’t move around the court either. It took him two hour-long sessions once a week for three months to find his game again. Since then, the 38-year-old general manager at an international music label has been playing three-four times a week, each session lasting about 90 minutes. “In just eight months after I started playing regularly, I started feeling fitter. I checked my weight and I was about 5kg lesser. Eventually my serves were coming on stronger and my shots were harder. This was proof that my shoulders, arms and back had gained strength. The fact that I was covering more of the court for longer durations indicated that the leg muscles had improved too," he says. 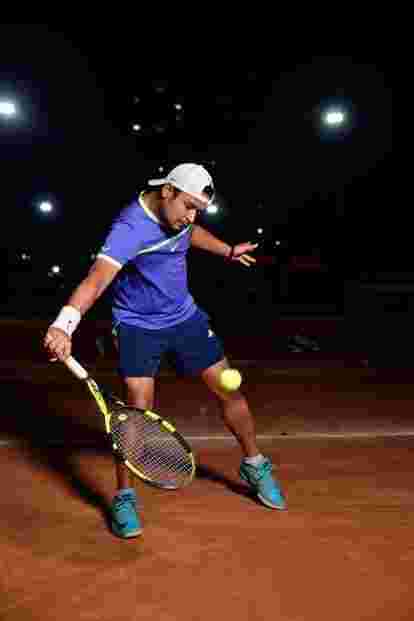 Expert opinion: Tennis coach Rekibul Hussain, who runs the Sports Centrum academy in Gurugram, says 4-6 hours of tennis per week is best for adults looking to maintain their weight and fitness levels. “Regular tennis also helps in staying mentally fit, strengthens bones and joints, increases energy levels, improves posture, breathing, stamina, immunity and blood flow… it basically improves one’s quality of life."